20g of fermented protein from a mix of 7 plant-based, organic sources! Good for your gut, easier to digest and absorb – with no bloat. USDA Organic and Non-GMO Project Verified. Get more from your protein. Only fermented organic vegan proteins+ gives you a more digestible protein with a balanced amino acid profile – and gut health benefits! Made with a custom blend of 7 high protein vegan ingredients – organic spirulina, organic mung bean, organic yellow pea kernel, organic pumpkin, organic flaxseed, organic hemp and organic brown rice – that provide a balanced amino acid profile. Plant-based protein sources are notoriously hard to digest – so we ferment them in small batches using non-dairy probiotics and enzymes. The fermentation process breaks down the anti-nutrients that cause gas and bloating, liberates nutrients – like amino acids, vitamins and minerals – so they’re ready for absorption, and creates new, more powerful nutrients that nourish and PRIME the gut. 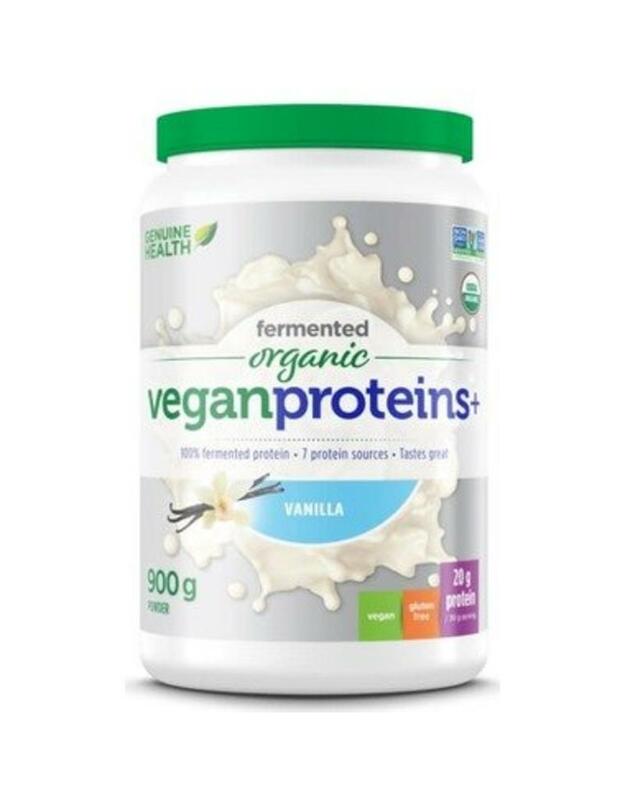 fermented organic vegan proteins+ is a highly absorbable protein that is ready for your body to use. Dosage: Mix fermented organic vegan proteins+ in water, blend it into your favourite smoothie, or add it to an energy bite or baking recipe – the possibilities are endless. 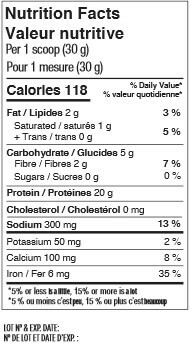 Mix 1 scoop (25.9 g) into 1 cup (250 mL) of your beverage of choice. Ingredients: Organic protein blend [organic fermented yellow pea seed protein, organic fermented brown rice seed protein, organic fermented vegan protein blend (organic hemp seed, organic pumpkin fruit, organic flaxseed, organic mung bean, organic spirulina)], Organic vanilla flavour, Organic stevia leaf extract, Xanthan gum. 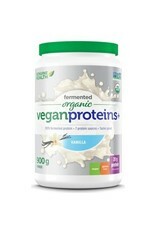 fermented organic vegan proteins+ contains no gluten, wheat, artificial colours, flavours or sweeteners.